Legend has it that the game was developed as a joke by a couple of programmers at Freeverse Software. It didn't take long for it to go viral, however, as Mac users around the world were struck with childlike joy and wonder at the opportunity to staple the day away. For the complete experience, some played SimStapler while being serenaded by Jared: The Butcher of Song (for background, read this:Who the Heck is Jared?). And all were eager to share it with friends, co-workers, siblings, or fellow students. The game's brilliance rested in its simplicity. The nature of the documents being stapled together was left to your imagination. Perhaps you were stapling two blank sheets of white paper. Or maybe the paper was purple. It could be that you were stapling together a ten-thousand page thesis (try doing that on a real stapler!) on the benefits of virtual office equipment. Perhaps you weren't stapling paper at all, but rather stapling a co-worker's shirt to their pants. The only limit was your imagination. Best of all, your stapling prowess was recorded right there on the screen and, assuming you had your speakers turned up, announced to everyone in the room via repeated stapling sounds. A counter kept track of how many times you had used the stylish red stapler. The top-notch, hyper-realistic sound effects were accompanied by a stunning animation of a stapler being operated by a person's finger. The graphics were, quite frankly, years ahead of their time. And a mysterious voice called out "Splendid!" every tenth staple, presumably in awe of your fine stapling ability. 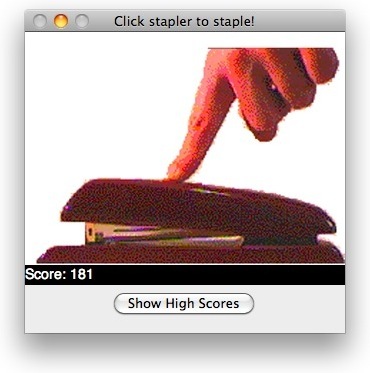 When Apple transitioned to Mac OS X, many fans worried that SimStapler would be lost to the ages. Their fears were set aside when the game was ported to OS X in 2004, before SimStapler became SimStapler Arena in 2007. The Arena version offered online leaderboards, making it easier than ever to play SimStapler competitively. Some gamed the system, however, as the MacLife team sought assistance from their readers by publishing the MacLife registration details in an article about the game while others used automated scripts. Thanks to their (admittedly clever) shortsightedness, we may never know who is the ultimate stapling champion. 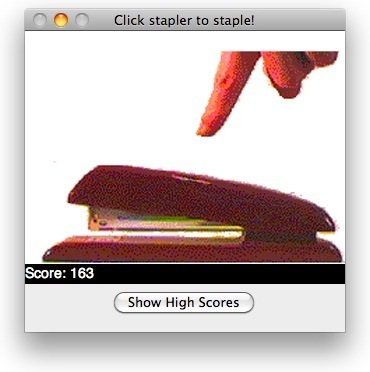 For years, the greatness of SimStapler remained a tightly kept secret by the insular Mac community -- even after the OS X port. Then Freeverse made the decision to release SimStapler for iPhone and iPod Touch (and then, sometime later, Android). This mobile version of the game came with a fake Mac OS 9 desktop, from which you could launch and play SimStapler. While long-time Mac users generally celebrated the news, some saw it as emblematic of a further loss of solidarity in the so-called Cult of Mac -- now anyone could get a taste of this cultural icon, regardless of whether they own a Mac or possess the requisite background contextual knowledge. 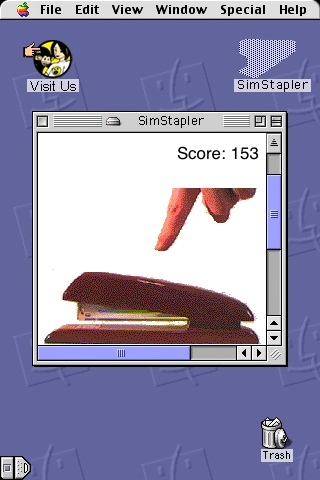 The mobile version of SimStapler, which looks a lot like the original System 7 version. The divisive reaction visible through amateur reviews and YouTube videos would seem to indicate that this concern was well founded, but, if I may be serious for a moment, we must remember that not everyone using a Mac in the mid-to-late 90s got or appreciated the joke. Even then, some people called SimStapler -- and other wacky software, such as Jared or Harry the Handsome Executive -- stupid (without adding something along the lines of "but somehow awesome"). Like it or not, though, SimStapler is a cultural artifact, and I hope you all can appreciate it as such -- even if you don't enjoy the mindless "click to get a higher score" gameplay, which has since been deployed rather less inventively in the satirical Cow Clicker social network game. I recommend playing SimStapler while being serenaded by multiple Jareds. Unfortunately, in OS X you can only set up a Jared chorus using widgets.